There's a new checkmark in the 'drinking isn't all bad for you' column. According to a new study that looked at more than 70,000 Danish people, those who drink small to moderate amounts of alcohol on a frequent basis are less likely to develop diabetes than people who don't drink at all. To be clear, these results shouldn't be seen as license or encouragement to drink freely as a health-promoting exercise. But they do provide further evidence that, for some reason, people who drink moderately are less likely to suffer from certain illnesses, including some cardiovascular diseases and type-2 diabetes. For the new study, researchers wanted to see how much alcohol consumption was associated with the lowest diabetes risk, and determine whether the type of alcohol or the frequency that people drank mattered. Using data from the Danish Health Examination Survey, they looked at the drinking habits of 28,704 men and 41,847 women, and tracked whether those people developed diabetes within approximately five years. The researchers excluded anyone who already had diabetes, was pregnant at the start of the study, and didn't provide information on their alcohol consumption. The results showed that the study participants least likely to develop diabetes drank 3-4 days a week. 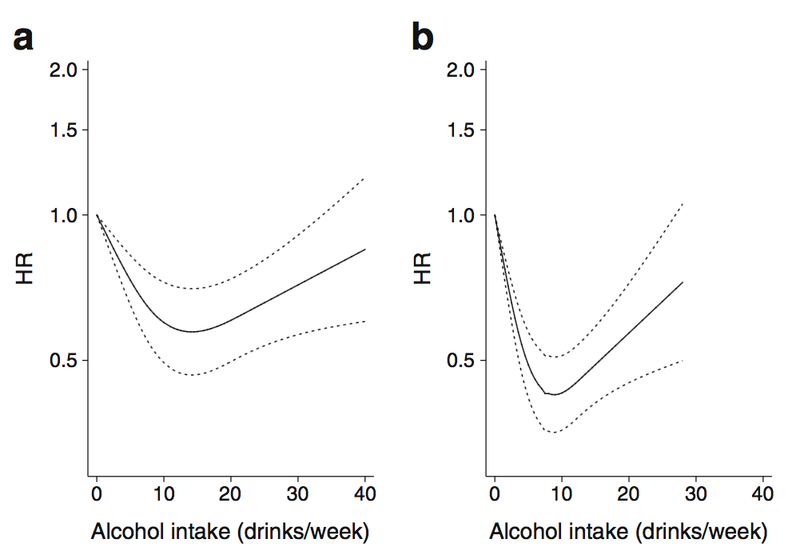 For men, those who drank 14 drinks per week had the lowest risk, as the chart on the left shows below. For women, those who drank nine drinks per week had the lowest risk, as the right-hand chart shows. As the U-shaped risk curve shows, study participants who didn't drink at all seemed to have a higher risk of developing diabetes. People who drank moderately had a lower risk, up to a certain point — after that, risk started to rise again. Even heavy drinkers (up to 40 drinks per week for men and 28 drinks per week for women), however, still had a lower risk of developing diabetes than teetotalers. The lowest risk was associated with drinking that was spread out throughout the week, rather than occurring in the same day or two. The type of alcohol mattered too. Men and women who drank wine had the lowest diabetes risk. For men, beer was also associated with a lower risk. Spirits didn't seem to affect risk for men, but women who drank seven or more drinks of spirits a week had an increased risk of developing diabetes. A brief but important aside on diabetes: The design of this study didn't allow researchers to say whether drinkers had a lower risk of developing type-2 diabetes or type 1. Type 2 is generally caused by lifestyle factors and prevents the body from using insulin, where as type 1 cannot be prevented since the body simply doesn't produce enough insulin. The researchers say their study should refer to type-2 diabetes, since their results held true even if they eliminated anyone under 40 (by which point the vast majority of people with type-1 diabetes already have it). Tempting as it might be to say that drinking lowers diabetes risk, we can't say that. All we know is that people — Danes, at least — who drink regularly develop diabetes less frequently. It's possible that this is because people who drink in moderate quantities tend to be healthier in the first place than people who don't drink at all. The researchers tried to calculate for these effects — they accounted for things like body mass index, physical activity, smoking status, and family history — but it's always possible that results were still skewed in some way. There is a hypothesis that moderate drinking may improve some aspects of health by lowering blood pressure and dilating blood vessels, but it's not certain whether that plays a role. There are a number of other complicating factors, too. On the one hand, most people under-report their drinking, meaning that people may actually be drinking more than they reported. Also, this was a population study in Denmark. Different results might be found in non-Scandinavian populations (especially non-white groups, many which have a higher risk of developing diabetes). When it comes to alcohol and health, we know that drinking too much isn't healthy. Alcohol consumption has been shown to increase the risk of certain cancers — a recent new report found a link between an increased risk of breast cancer and drinking as little as one glass of wine or beer each day. The researchers behind this study aren't advocating for drinking as a means of health promotion. But at least in regard to diabetes, drinking what's considered a moderate amount throughout the week seems to be fine.